The books may be purchased in multiple formats including HTML, PDF, ePub, and print in black and white, or color. This is a low-cost textbook available from FlatWorld Knowledge for introducing microeconomics. 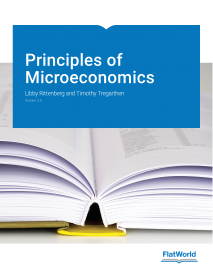 The authors have written both a microeconomics and macroeconomics textbook and use integrating themes to present economics so that students realize that it is a unified discipline and not an array of seemingly unrelated topics. The integrating theme for microeconomics is the marginal decision rule, a simple approach to choices that maximize the value of some objective. Following its presentation in an early microeconomics chapter, the marginal decision rule becomes an integrating device throughout the discussion of microeconomics. Instead of a hodgepodge of rules for different market conditions, they give a single rule that can be applied within any market setting. Additional instructional aides are available for purchase by students. Ancillaries for faculty are available free. You just viewed Principles of Microeconomics 2.0. Please take a moment to rate this material. If you know the author of Principles of Microeconomics 2.0, please help us out by filling out the form below and clicking Send.